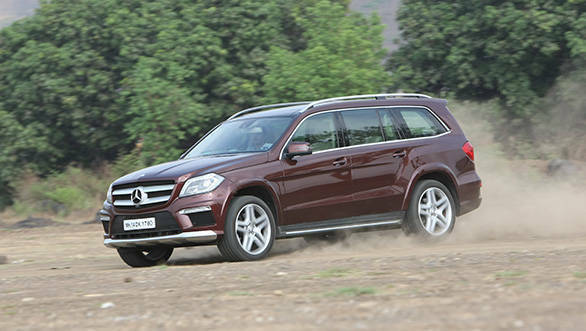 The Mercedes GL might not have sold very well in India, but then, given its price and positioning, it never really had a fair chance. That situation hasn't been rectified in the newer version of the SUV either. But it looks better, has a more powerful engine and carries current design and features. Still, are these changes good enough to bring it back in the reckoning? The new GL is a large car. 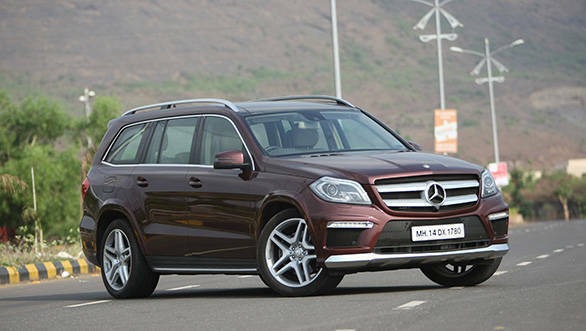 Measuring over five metres in length and almost two in width, it is Mercedes' only full-sized SUV. But in the flesh, it doesn't look as overbearing as the Audi Q7  one of its main competitors. It doesn't look as sporty either, but makes up in a classier presence. More importantly, it comes across as a grown-up car which has been designed with a clear thought process in mind  seat seven in comfort and luxury and then go out and take on the world. Even though in this latest iteration, Mercedes has tried to add some bling - there's more chrome, more muscular looking bumpers and an in-your-face grille with large headlamps - it still retains its utilitarian (in a good way) roots in the form of a high and flat roof, less curvaceous sides and a large glass area all round. All this helps make the GL one of the more practical buys in the high-end luxury SUV space. The GL's practicality is well communicated by the space the it offers to its occupants  all seven of them. The last row seating is particular is class-leading. The seats are comfortable and large, there's more than enough knee, shoulder and head room, and there's a comfortable armrest with integrated cup holder as well. The second row is no different. In fact, the seats and space are good enough for the well-heeled to consider this as a chauffeur driven car as well. But, as is the case with most European cars, the best place to be, is in the driver's seat. For starters, the one in the GL is adjustable in every way imaginable, and getting comfortable in it is only a matter of pushing a few buttons. Moreover, the steering - electrically adjustable again - is adjustable for reach and rake. Not only is it easy to find the perfect driving position on the GL, the clear visibility all round ensures you are instantly comfortable and ready to take on the busiest roads. There's loads of equipment on board too. 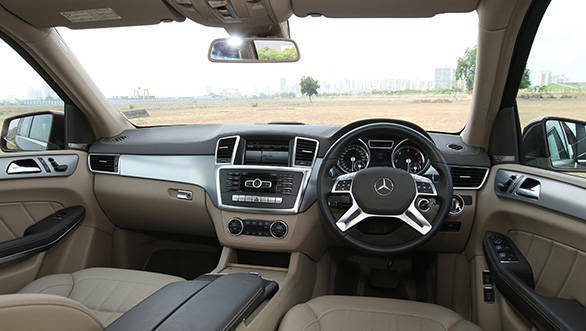 The GL gets nine airbags, ESP, ABS, intelligent lights, Pre-safe and Mercedes' own attention assist, and all this in a body which has been designed with passenger safety above all else. There's no shortage of comfort and convenience equipment either. Offered as standard on the GL 350 CDI is a three zone climate control system, power seats and mirrors and the current generation COMAND system to handle everything from your calls to your music needs and even navigation. It also gets a fancy sunroof, some delectable interior lighting and a smoker's package. Our favourite convenient feature though, is the Active Parking Assist. Just like we have seen on the Passat, the GL selects an appropriate parking spot and then guides the driver towards selecting reverse or drive while it steers itself into the selected space. It's quick, effortless and almost magical. And for a vehicle this size, it's also a life saver. As we've established, the GL is a large car. But it doesn't feel cumbersome to drive at all. The controls - steering, throttle and brake - are effortless to use and have seamless progression and decent feedback. Additionally, the SUV has a respectable turning circle and outstanding visibility for a vehicle this size. Even on the move, it is impossible to tell that the GL weighs in at a portly 2175kg. This is all down to its 3-litre, V6 diesel. The engine is essentially the same power plant the SUV came with earlier, but it makes more power and torque in this version. Every time the throttle pedal is pushed, there's no lag or reluctance. In fact, the GL just doesn't get a move on, it surges ahead with an enlivening shove. It gets to 100kmph in 8.5 seconds and completes the quarter mile in 16.2 seconds. 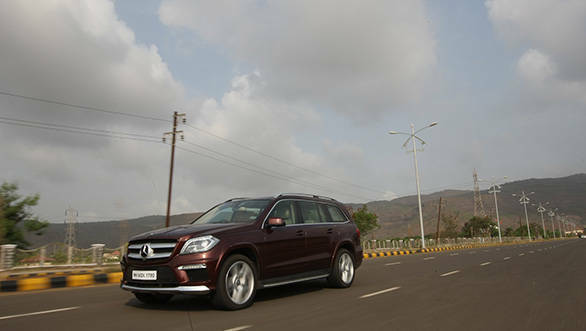 Top speed is an equally applause-worthy 220kmph; we are talking about a two tonne-plus, nearly two metre high SUV, after all. The weight and size does catch up with the GL around a series of corners, however. The Mercedes comes with height-adjustable suspension and gets two settings for its dampers  Comfort and Sport. At its lowest and with the dampers set to Sport, you'd think, a modern SUV like the GL would be very much at home handling corners. It isn't. If it's just a one-off bend, the Mercedes feels fine; the turn in is acceptable and the body roll, though present, isn't alarmingly high. But, put it through a sequence of bends, and it never really seems to recover from one corner to the next. The front still manages to keep up with the driver's inputs, but the rear fails at it miserably. It feels ungainly, and is one of the few vehicles where kicking the tail out is more unsettling than fun. Unsettled can also be used to describe the GL's ride quality. And that's probably the only aspect we did not like about the new GL-Class. The ride is noisy and it also thumps its occupants in very un-Mercedes like way. The ride apart, the GL looks better, comes with more equipment, is quicker and remains as spacious, luxurious and practical as before. It is just the right vehicle for those who love traveling with the family or friends in luxury, comfort and safety; on road or off it does not matter. And yes, you also need to be rich, quite rich.